Performance Time: Approximately 40-60 minutes, 44 pgs. HOLIDAY. 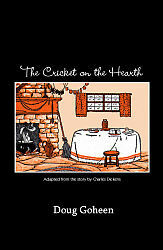 Adapted from the story by Charles Dickens (1845). A poor toymaker, Caleb Plummer, lives with his blind daughter in a tiny dilapidated home that is owned by his employer and landlord, the miserly Mr. Tackleton. To shield his daughter, Bertha, from the harsh realities of life, Caleb portrays their home as snug and cheerful and describes Mr. Tackleton as a kind, honest, and generous man. As a result, Bertha falls in love with Mr. Tackleton and is saddened upon hearing the news that Mr. Tackleton will be wed on Christmas Day to May Fielding. As Christmas nears, May becomes more distraught at the thought of marrying the much older Mr. Tackleton. But when a mysterious old gentleman appears on the side of the road just two days before Christmas, it proves to be like finding a cricket on the hearth?the luckiest thing of all.